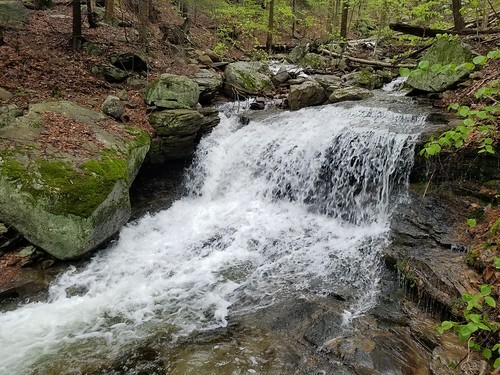 Somer Brook is located deep in SGL 57. It has carved a deep gorge in the plateau featuring big rocks, rapids, pools, slides, and several waterfalls. It is a place of rugged, dramatic beauty. A few weeks ago, I decided to check out this gorge. 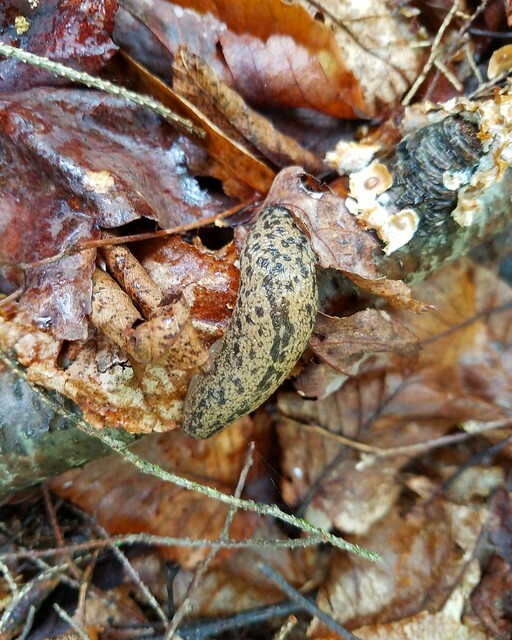 With recent rains, and the game lands road to the top of the mountain opened for turkey hunting season, it was an ideal time to do some exploring. I parked at the last parking area before the gate and followed the gated roads, which were flowing with water through the spruce forests. 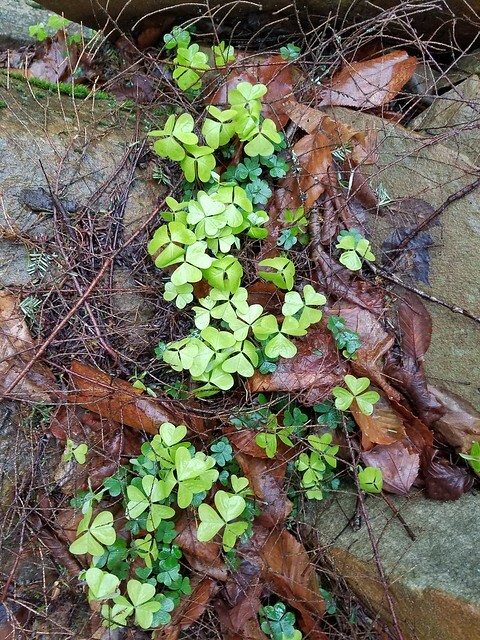 The woods were incredibly aromatic. 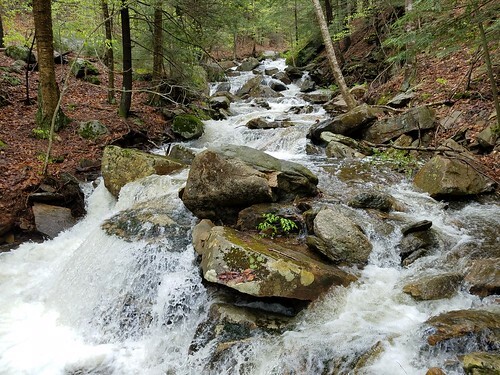 I turned right on the next road and crossed Somer Brook, rushing with water. I continued on the road as it went around the top of the plateau until I reached a discreet side stream. 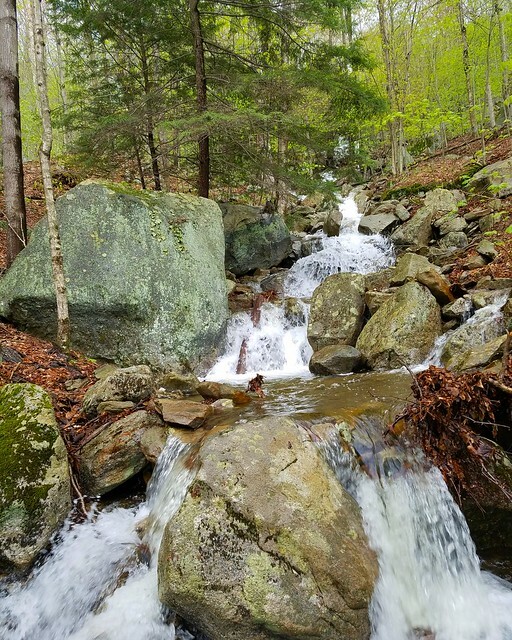 My bushwhack began as I descended this stream. This small stream proved to be gorgeous with a slide and then a 15 foot falls over a cliff. Below was a gauntlet of large boulders and nonstop cascades and pools. The scenery became even better. Three stream joined at the same place among a slope of large boulders. 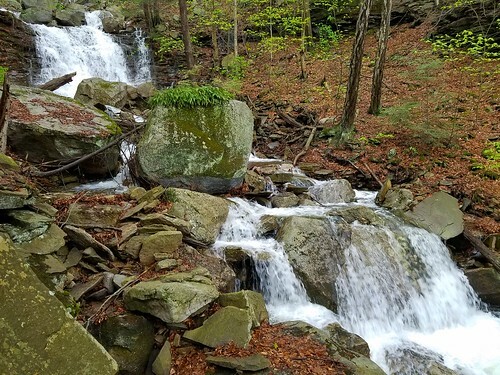 There were waterfalls and cascades everywhere as the water tumbled over the boulders. It was breathtaking. These three streams converged into a larger one that continued with cascades until it disappeared over the edge of a grotto. I descended into the grotto to see a place of great beauty. 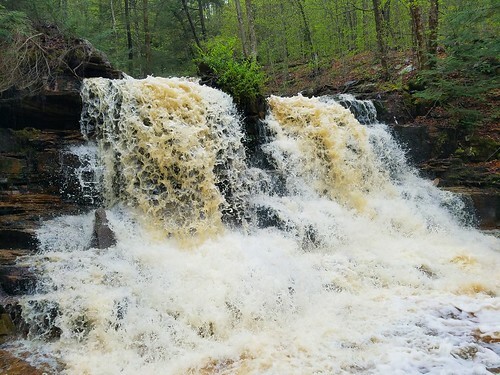 A 20 foot falls with huge car sized boulders at its base, followed by more waterfalls. Ferns covered some of the boulders. I named this place Atkinson Falls. As I negotiated the tough terrain, there were many loose rocks that shifted under my feet. I stepped on one rock, and the other end shot up, slamming into my shin. It was very painful as blood oozed from my leg. I had no choice but to keep walking. Below was an 8 foot falls with a long slide over red bedrock. I could see Atkinson Falls above through the trees. 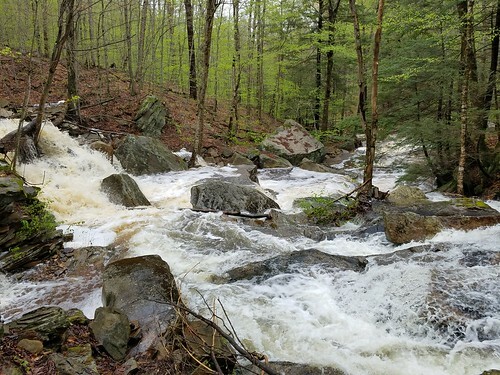 This unnamed creek continued with rapids and boulders until it joined a rain swollen Somer Brook. Somer Brook worried me- it was a raging whitewater river as it surged between boulders and swirled through pools. I needed to find a safe place to cross. I made my way up the creek and found a calm, shallow pool above some rapids. With my poles, I made it across safely but the current was surprisingly strong. 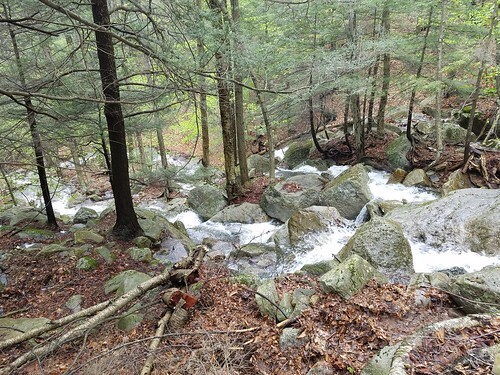 I looked upstream to see Somer Brook choked with boulders and whitewater. This place was wild, untamed. I found another unnamed sidestream and began the arduous hike up. My legs shook with pain and exhaustion. This sidestream was filled with cascades over boulders, but no distinct falls. I then reached Southbrook Road. I followed the road a short distance and then saw an old, discreet grade to my left. 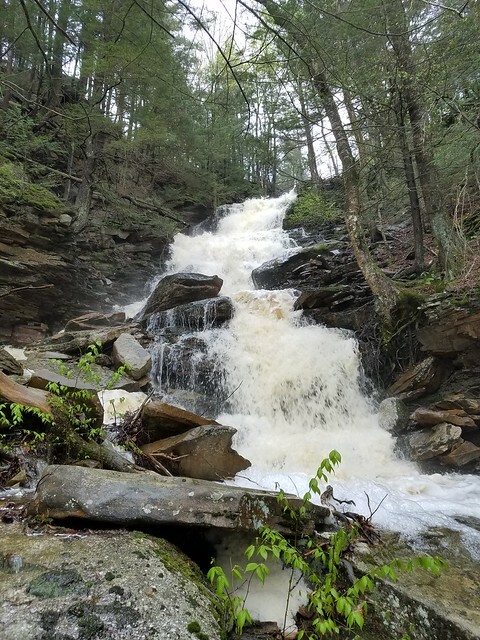 I knew this led to the base of Somer Brook Falls, the tallest of them all. I reached the base of the falls, crossing the powerful creek again above a 15 foot falls. 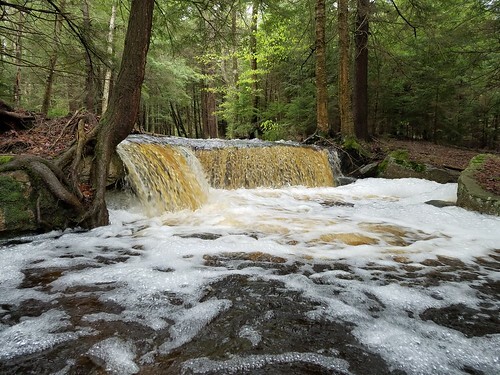 The base of the falls was filled with natural foam from the reddish swamp water. I reached the point where the two branches of Somer Brook joined- it was awesome. The forest and gorge were filled with the roar of water. Trees dripped with moisture. 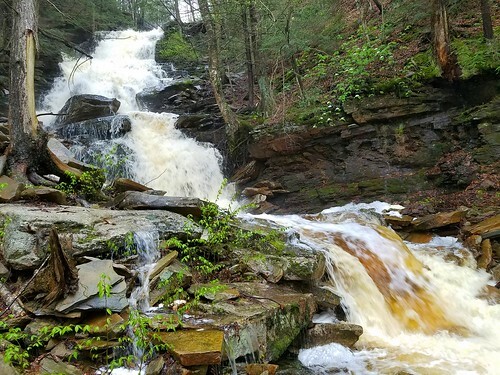 I made my way up to Somer Brook Falls and it was a stunning sight as a torrent plummeted 80 or so feet through a chasm. This is an amazing falls. I made my way up the top of the chasm through a forest of hemlock and spruce. Above is a beautiful spruce forest with a 3 foot falls over pebbly conglomerate. I made my way through the deep green spruce forest over the blood-colored water from the tannins in the spruce and hemlocks. I returned to the road and made my way back to the car. This is an amazing place, a gem in not only SGL 57, but all of Pennsylvania. I’m glad I was able to experience it. Location of Somer Brook Gorge. 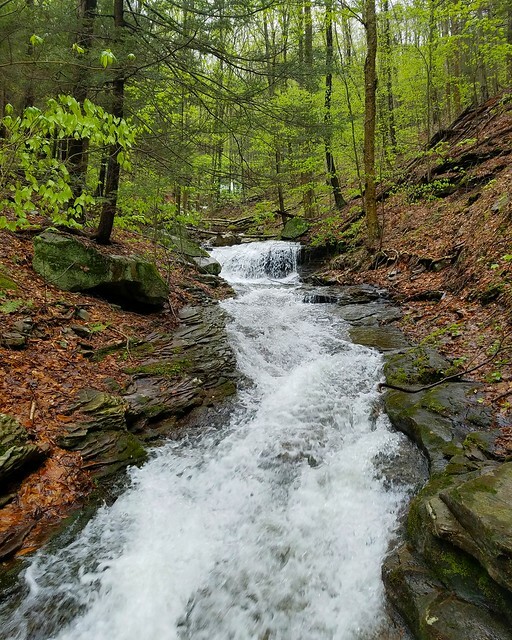 This entry was posted in Uncategorized and tagged Endless Mountains, Hiking, pennsylvania, sgl 57, waterfall, wyoming county by endlessmountains. Bookmark the permalink.